Here is the debut publication of “Insights in DRM – A Practitioner’s Perspective on Disaster Risk Management in Latin America and the Caribbean”. 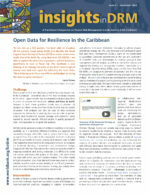 The first issue, Open Data for Resilience (OpenDRI) in the Caribbean, focuses on the use of spatial data in decision making to reduce disaster risk. This LCSDU* publication, “Insights in DRM”, aims to highlight DRM interventions in LAC and share knowledge with development practitioners, as well as aficionados in government, private sector, and civil society. Upcoming issues will include topics such as risk assessment, disaster risk financing and insurance, climate resilience and other related themes.